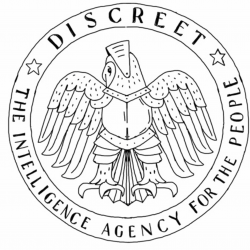 DISCREET is a new kind of intelligence agency that is currently under development. Between June 22 and July 11, 2016—during the 9th Berlin Biennale for Contemporary Art from June 4 to September 18, 2016—fellows helped to draft DISCREET’s basic mission statement, its goals, strategies, and actions for an open-source secret service organization. Participants helped shape the agenda for a post-war “discreetness” (a type of knowing silence oriented towards diplomacy instead of warfare) in order to replace the hegemonic war of terror-secrecy. DISCREET is an organization created by Armen Avanessian and Alexander Martos in collaboration with Christopher Roth and a stage by Markus Miessen.